Your one-stop Mac maintenance tool to clean up 20 types of junk files and remove Mac malware and virus to protect your Mac, Besides, MacBooster can optimize Mac hard disk to boost your Mac to the peak performance. What MacBooster 7 Advanced Can Do for You? MacBooster 7 Advanced scans every corner of your Mac. 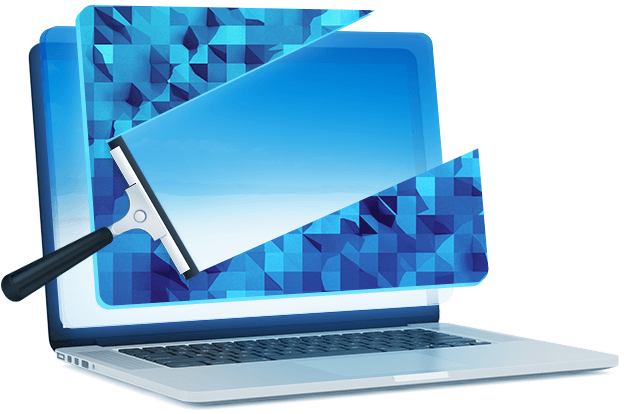 With five cleanup tools, MacBooster helps remove gigabytes of junk files from your Mac. Free up your Mac hard disk and give your more space to run your Mac smoothly. This is particularly helpful for Mac users with smaller SSD hard disks. With one click, MacBooster scans and removes over 20 types of junk files. Give your Mac a full cleanup and regain more space. Large & old files take up huge space of your Mac hard disk. Within few seconds, MacBooster can locate and remove them easily. Duplicated files can be generated easily on Mac. Why waste space to keep them? MacBooster finds them and smart cleans the duplicated ones. Why your Mac is getting slow and slow? Mac disk permission issues, high Mac RAM consumption and login startup items are the main culprits to your slow Mac. 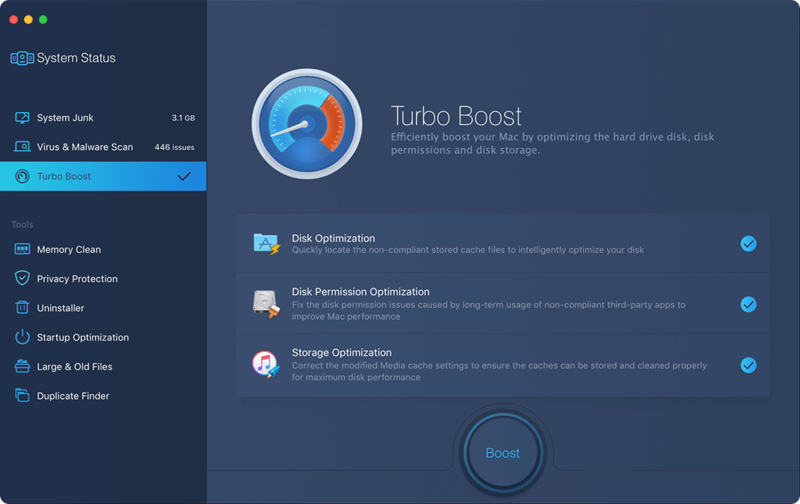 MacBooster can solve these problems technically and boost your Mac to the peak performance. Mac is getting slowly as more stuff is running behind and the RAM is cluttering up. By using MacBooster, you can find out which apps are the main consumers. It helps you to optimize or even close those apps taking up the memory and free up inactive memory for a faster running Mac. When you find your Mac is slow to launch or running slow, you should notice that many of the login startup items are taking up and even scrambling for resource from your Mac RAM and CPU. 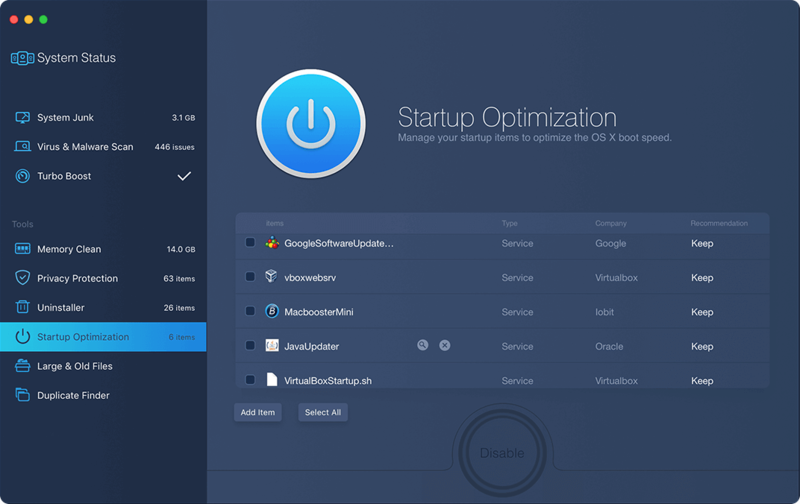 MacBooster analyzes your macOS and optimizes these startup items to speed up your Mac like new. Internet security is always what we should care about. Hackers attack any operation system no matter macOS or Windows. There are so many adware, malware, spyware and virus out there full of the whole internet. They are created to steal information from you or just mess up your system. MacBooster provides real-time protection for your Mac and keeps your Mac away from all kinds of online threats. MacBooster offers full scan of your macOS and removes any virus or threats from your Mac. 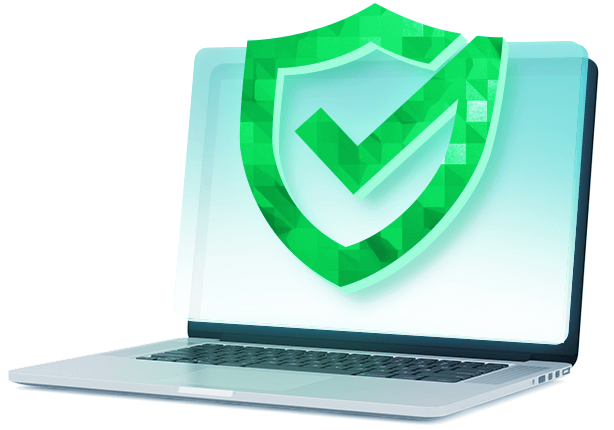 Any spyware or attacks will be blocked by MacBooster’s real-time protection. Malicious cookies in the browsers or unsafe app may track or even get your personal information leaked. MacBooster guards your privacy all the time. Let you enjoy a safer & cleaner browsing.